Our owner-operated store is always customer friendly. You can be sure that you'll receive personal help and service to answer any of your maintenance or construction questions. Your questions will be answered by staff who themselves have a contractor background; you can rely on their expertise to solve your problems. 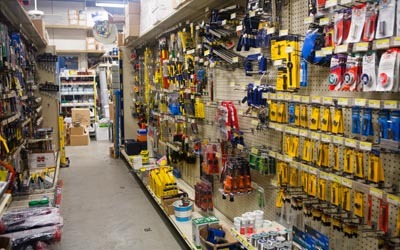 St. John Hardware keeps a complete inventory of almost anything you'll need to satisfy your most basic maintenance needs all the way through plumbing and electrical construction materials. Our large St. John Hardware selection also includes an extensive pool supply department. For you to be able to ensure that you get the best possible job done in your home, you should limit your options among contractors that will be able to take the best possible care of your home systems. Browse our list of recommended contractors in the St. John area by clicking here. 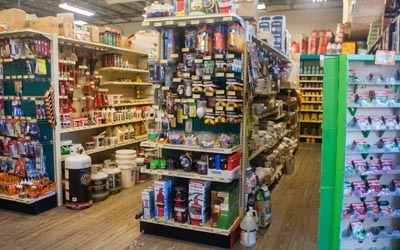 We know that every time we go to St. John Hardware, we're going to find exactly what we need to keep our properties running smoothly. If you need it, chances are they've got it. What I love most about St. John Hardware is the staff. They know what I need, and can properly recommend products based their own contractor experiences. Wide selection of PVC, CPVC, copper, steel, & brass plumbing supplies - along with toilet and faucet repair supplies. Wiring, switches, outlets, wall boxes, indoor & outdoor covers, electrical tools, and much more. All necessary supplies, testing kits, filters, cleaning systems & chemicals for pools and spas. Window, title, & surface cleaners; degreasers, dish soap, vacuums, floor cleaners, and laundry items. Potting soils, mulch, fertilizers, a huge seed selection, and a wide selection of gardening tools. Imperial and metric bolts, buts, screws, hinges, fasteners, knobs, deck supplies, eye hooks, and locks. Wide selection of kitchenwares, cooking supplies, coffee makers, blenders, and Eureka vacuums. Indoor and outdoor home paint, spray paint, deck paint, brushes, pans, and polyurethanes. Tool kits, hand tools, power tools, drills, sawzall blades, orbital sanders, and hammer drills.